Now that’s cleared up it’s very simple, sake has two enemies: heat and light. It is amazing how storing sake at a warm temperature can really affect the quality of the sake. 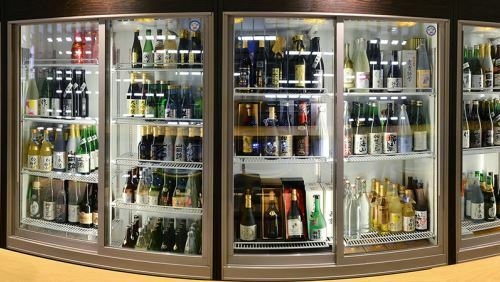 The ideal conditions are refrigerated so, if you have the fridge space, you can keep your sake nice and chilled and fresh. The next ideal location would be in a wine cooler with a constant temperature below 15 deg C. Ultimately, any place with a constant temperature, below 15 deg C will be ok. The longer you want to keep the sake for (and we’re talking months here, not years!) the cooler you’re going to want to keep your sake. In Japan, most sake is matured at temperatures below 5 deg C.
Changes in temperature really upset sake too. The worst place to keep sake would be, therefore, somewhere like the kitchen where the temperature goes up and down the whole time. Of course with namazake (unpasteurised sake) it is imperative you keep your sake refrigerated the whole time! There is also a question of orientation – do you store sake horizontally (like wine) or vertically? Ideally, you’d store it vertically to avoid contact with the cap – and thus any possibility of rusting/corrosion tainting the sake – but in practise it’s really not going to make too much of a difference, unless you’re laying down your sake for an experiment in long-term ageing. However, storing the sake vertically also reduces the amount of sake in contact with oxygen so, ideally, store your sake vertically upright if possible! Sunlight is the worst but even long-term exposure to light from the fridge can be bad! I once tried a sake that had been (purposefully) exposed to sunlight for only two weeks, the degradation in quality was most apparent. If you don’t have a dark (cold) place to store your sake then I suggest you wrap each bottle in newspaper to eliminate any light getting in. If you store your sake in a cold, dark place you should have no problem with quality degradation. Remember: sake is a low intervention, delicate product – please handle with care! And, if you are buying it for a gift, best not to pop it under the Christmas tree for a week!